380 pages | 119 B/W Illus. This book is part of a series of titles that are a spin-off of the Shingo Prize-winning book Leveraging Lean in Healthcare: Transforming Your Enterprise into a High Quality Patient Care Delivery System. Each book in the series focuses on a specific aspect of healthcare that has demonstrated significant process and quality improvements after a Lean implementation. The result of implementing Lean in the surgical suite is a powerful and proven mix that enables members of cross-functional teams to improve their processes, efficiency, and financial performance. Leveraging Lean in Surgical Services: Creating a Cost Effective, Standardized, High Quality, Patient-Focused Operation provides a functional understanding of Lean processes and quality improvement techniques for the surgical department. This book is an ideal guide for healthcare executives, leaders, process improvement team members, and inquisitive frontline workers who want to implement and leverage Lean in the surgical suite. Supplying detailed descriptions of Lean tools and methodologies, it identifies powerful solutions specific to the needs of surgical services. The first section provides an overview of Lean concepts, tools, methodologies, and applications. The second section focuses on the application of Lean in the surgical services environment. 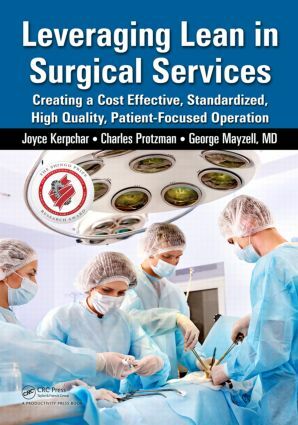 Presenting numerous examples, stories, case studies, and lessons learned, it examines the normal operation of each area in the surgical suite and highlights the areas where typical problems occur. Next, the book walks readers through various Lean initiatives and demonstrates how Lean tools and concepts have been used to achieve lasting improvements to processes and quality of care. It also introduces actionable blueprints that readers can duplicate or modify for use in their own institutions. Illustrating leadership’s role in achieving departmental goals, this book will provide you with a well-rounded understanding of how Lean can be applied to achieve significant improvements throughout the entire continuum of care. Conclusion – Do you consider the Operating Room a Cost Center or a Profit Center? How Do We Improve Turnover? New Room for a "to Follow" Case Referred to as "Move"